iDirect Marketing qualifies mortgage leads and transfers the data to various lenders. They receive calls from telemarketing call centers and input all of the data a lender needs to process a loan application, then sends that data to the lender. Take a poorly designed, barely functional database application and build it into a robust, easy to use system that delivers leads to the lenders accurately and in real time. Reports also needed to be developed to let management monitor the performance of their agents, view statistics on leads and call centers, and track the successful transfers for each lender. Andrews Consulting took over the existing Visual Studio 2003/SQL Server 2000 project from the previous company and added an authentication system, user management, lender and call center admin, and new, functional reports. SQL Server 2000 and Reporting Services were already in place but the existing reports were useless and the data transfer functions were extremely sensitive and prone to error. 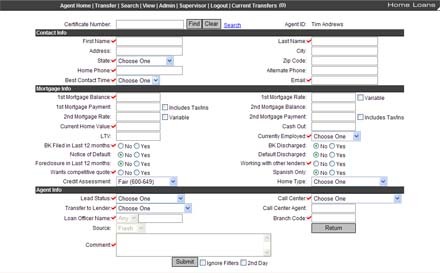 Support for direct XML lead transfer was added for lenders that were capable of accepting XML, HTTP POST for others, and the rest receive emails with an Excel spreadsheet attached containing their lead data. A data import application was developed to monitor an FTP site for data files and automatically loads the leads into the database. All of the issues were fixed, lots of new features were added to give complete control to iDirect staff, and the data transfer service is now very reliable. Various new reports were designed and are used daily to monitor the flow of information from the call centers to the lenders. iDirect management has the ability to add and delete users, lenders, and call centers and view the transfer history of any lead through an easy to use interface.